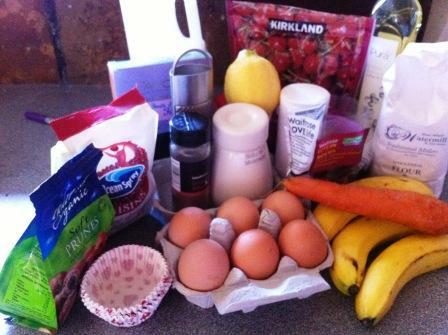 The All But Muffin – All But the Kitchen Sink! I was asked by fellow POATer, Jackie Kaines Lang, if I’d like to be on her radio show. Immediate reaction was oh yes! So a quick jaunt down to the Borders and I was talking to her on Radio Generate, a local radio station that was based in the market town of Duns, and what was the subject? Cakes to eat after exercise! Those of you who know me will realise I’m built for comfort not for speed, but I do have a reasonably healthy recipe for muffins. The All But muffins are drop-dead simplicity itself. I sometimes make them for my boy, Toby, after his training sessions at Edinburgh Athletics Club. He hurdles for Scotland at senior level. 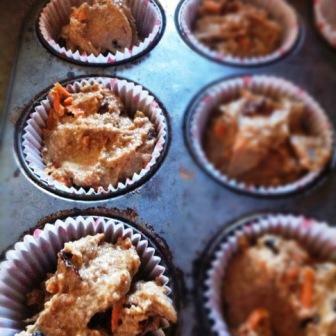 If you do exercise, have one or two of these muffins with chocolate milk; that’s what The Boy does after his training. It has been proven that milk actually helps the muscles recover more quickly. The carbohydrate and protein ratio in milk complements each other; the carbs replace energy and the protein rebuilds muscle! Lecture over; let’s get on with baking. They really are mix and match; put in your favourite things. Don’t expect them to be big and fluffy, they will be fairly dense because of the amount of fruit. The All But Muffin ~ all but the kitchen sink! 1. Line a muffin tin with muffin cases. 2. 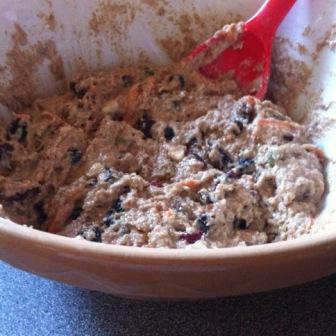 Put the first four dry ingredients into a large bowl and stir to combine. 3. Mash the banana with egg, honey, milk and oil or butter in another bowl. Then add your choice of other bits. 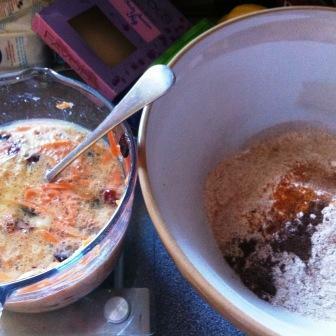 I throw in all sorts of stuff: dried cranberries, blueberries, sultana, raisins, apricots, grated carrot, grated apple, dried pineapple, glace or dried sour cherries, prunes, soft dried figs and anything else at hand into the wet mix. It really is a case of mix and match of whatever you like. I don’t weigh I just grab ‘n’ chuck. 5. Spoon into muffin tin. 6. Sprinkle with sunflower and pumpkin seeds or walnuts for extra crunch. 7. Bake in a medium oven 190C/Fan170C/Gas 5/375F for about 10 – 12 minutes. 8. Leave in tin to cool slightly, then finish cooling of wire racks. 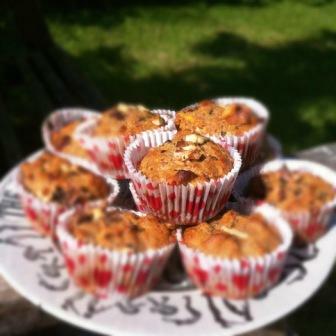 The All But muffins won’t win any beauty competitions but are full of goodness! Previous Previous post: Lavender’s Blue, Dilly, Dilly! How to Bake Responsibly with Lavender! Next Next post: Duck Legs ‘n’ Dryers!